Written by NIWA oceanographer and voyage leader Dr Mike Williams. Yesterday was the day the iceberg sweepstake came off the wall. Shortly after we left Wellington a list went up on the wall in the mess with the 24 hours of the day divided into 20 minute chunks. Each day people placed bets on when we would see the first iceberg. The rules state it has to be an iceberg, not a bergy bit, or a growler. Growlers and bergy bits are names for smaller remnants of big icebergs, or chunks that have broken off the ice shelves around Antarctica (or Greenland). Growlers are the smallest chunks and are usually less than 5 m in length and 1 m high. Bergy bits are from 1-5 m high and 5-15 m in length and can weigh up to 10 tons. 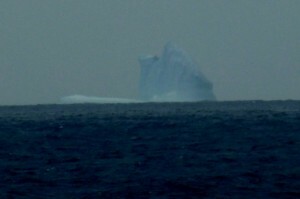 A true iceberg is usually several kilometres long, and hundreds of metres thick. The largest to calve recently was the 200 km long B-15A, which calved from the front of the Ross Ice Shelf, near New Zealand’s Scott Base, in 2000. Icebergs are at their largest when they calve from the ice shelf or glacier. After this the iceberg melts both from heating by the sun and from the ocean underneath. 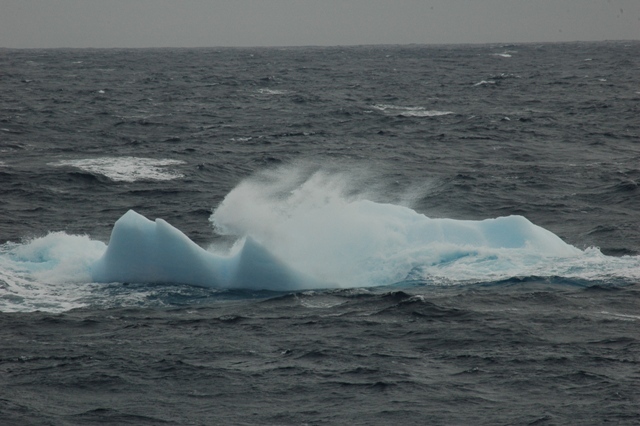 Waves also physically erode its sides and small pieces of ice constantly break off. If the iceberg becomes unstable they can roll, revealing their beautiful blue underside. 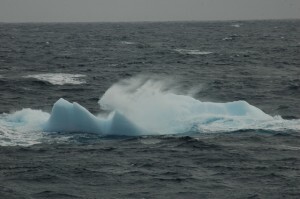 The ice in icebergs is formed from compressed snow, which has often fallen a long way from the coast where they calve. When they initially calve they look white in colour because of the air that is trapped inside the ice. As the ice is further compressed the air bubbles become smaller and the ice changes to a blue colour. The blue colour comes about because the ice transmits light in the blue portion of the visible spectrum, while absorbing the others. Satellites watch and track the largest icebergs, which are given names by the US National Ice Service. The letters A-D tell you which of the four 90° sectors of Antarctica the iceberg comes from. The number is the order the icebergs in that sector calved in. Finally, there are letters on the end for each of the daughters which calve from the original iceberg, so B15 broke into B15A and B15B, etc. 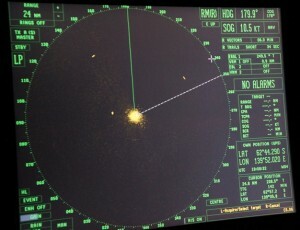 Nobody knows where the icebergs we have seen today will go. Their individual shapes, whether they be pinnacles, domes, dry docks, or the classical tabular berg, mean the wind, waves and ocean currents push each iceberg differently. But we doknow that as an iceberg gets smaller the balance of these forces also changes. When icebergs are large the ocean currents are the most important factor in determining where they go, but as the as the icebergs get smaller wind and waves become more important. 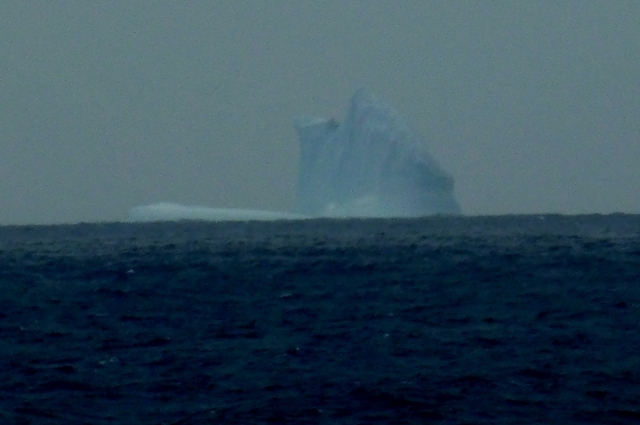 The furthest north an iceberg has been seen is 23°S, but this was in the Atlantic. Closer to home we have even had icebergs off New Zealand! 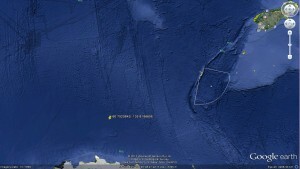 In 2006 part of B15A sailed past Dunedin, while other parts of the original B15 are still stranded on the seafloor near Antarctica. In the end the first bit of ice past the ship was a bergy bit, aptly spotted by the ice pilot Arne Sorenson (good to know he has a keen eye for these things). We had to wait another 30 minutes for an iceberg to go past at 61.82˚S, 139.86˚E. The lucky sweepstake winner was Gemma, the ship’s steward. 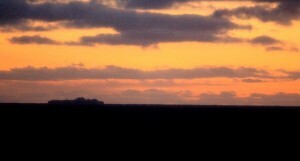 At sunrise this morning there were quite a few more icebergs on the ship’s radar and visible on the horizon through the binoculars. The officers will have to be very vigilant from now on.